Acting Prime Minister, Aiyaz Sayed-Khaiyum says the 2013 constitution reinforces the land ownership of the iTaukei people in Fiji. This was highlighted by Sayed-Khayum during the debate on the 2015 Annual Report for PAFCO in parliament. Sayed-Khaiyum says this is the best protection for iTaukei land compared to the 1990 and 1997 constitutions. 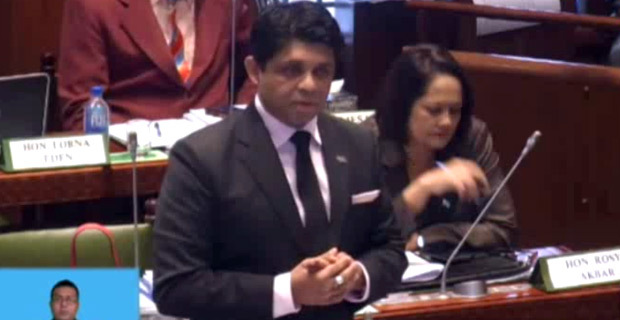 SODELPA MP, Viliame Gavoka says the Minister was waving the 2013 constitution saying this is the future of Fiji. He says it is not Fiji and it is not meaningful to us if something that is valued at $860,000 is eventually reduced to $200,000. Gavoka says the constitution is meaningless to us if that is the case. Sayed-Khaiyum says the previous system only benefitted a few people and even the qoliqoli owners could not go to the surfing areas. Chairperson for the Standing Committee on Economic Affairs, Lorna Eden highlighted that tuna harvest in Fiji is limited to 12,000 tonnes per annum whilst the capacity of PAFCO is 35,000 tonnes per annum which means there will always be a need to buy tuna from outside of Fiji’s exclusive economic zone. Eden says the committee recommends that relevant stakeholders be encouraged to pursue all avenues to assist PAFCO with this issue and one possibility was to look into membership options for Fiji becoming a party to the Nauru Agreement which currently controls the vast majority of available tuna stock in the region. She adds that another avenue suggested was to revisit dialogue with Kiribati who are renowned for their fish stocks. Eden further stated that the committee noted, the other challenges faced by PAFCO in 2015 were wharf and handling fees. She says with regards to operating challenges the committee noted that the supply of electricity and water were limiting factors in relation to PAFCO’s future operational needs and that the issue be prioritized. Sayed-Khaiyum said that the issue of electricity is very important and that the Global Green Growth Institute and the government have identified Taveuni and Ovalau as the two islands where the government hopes to get 100% renewable energy sources therefore increasing the capacity of those two islands having electricity.